When you install a new gate or gate opening system, your list of requirements is usually long. You’re in search of security, strength, and efficiency. An automated gate needs to work effectively and consistently, otherwise, it fails in many of these regards. 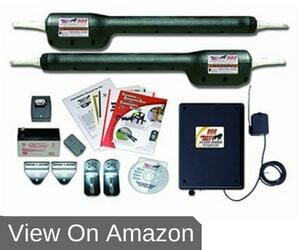 Mighty Mule FM502 reviews show that there are automated gate systems that adhere to these requirements. Although there’s an upgrade of this system—the Mighty Mule 562 which meets UL325 6th Edition standards—a contest of the Mighty Mule 562 and the 502 is unnecessary. Both the systems function well and showcase the characteristics we mention below. The Mighty Mule FM502 offers a durable gate opening system for gates up to 18’ long. You can even connect it to a gate as heavy as 850 lbs. The unit is so user-friendly that you can install the kit yourself as long as you have the necessary knowledge and tools. The exceptional aspect of the Mighty Mule 502 is that it works on many gates. Different types such as wood and ornamental gates can be controlled by this system. Apart from different sizes and weights, you can install it to open your gate inwards or outwards. You don’t want to add high installation fees to your gate’s costs. The Might Mule 502 manual helps so that it’s not necessary to hire technicians. The design of the Mighty Mule enables you to install it without even welding or needing an electrician. The installation kit includes an interactive DVD, which tells you all you need to know. We all know the maintenance necessary to keep an automated gate in excellent condition. Luckily, Might Mule gate opener problems are kept to a minimum, thanks to the designers’ attention to detail. The gate features soft start and stops movement. This is beneficial because most of the wear and tear of a gate’s parts happen when it comes to a stop or starts moving. With less momentum during these procedures, there’s less strain and friction on the metal parts. It’s not as durable as some other motors on the market. It may work at first, but it quickly wears out. Customers love that the mechanism doesn’t allow for gaps between gates. The aerial is permanently connected to the box. Users can’t move it. Where hot or cold climates may damage the component, there’s nothing the client can do about it. What if electricity is a problem? You’ll love that you can choose this gate’s power source. If you want to stay eco-friendly—and use less power from the grid—simply hook up the solar power unit. It affords enough power to keep your gate working daily. The control box affords you space to add a 12V, 7-Amp battery to the system. If you expect power outages, you can plan ahead so your gate works when you need it to. It’s inevitable that some parts of a gate opener will experience wear and tear. The manufacturer provides Mighty Mule 502 replacement parts. You can obtain the part you need without buying a whole kit. Ordering from the manufacturer means you’re assured of the same excellent quality as before. Mighty Mule FM502 reviews are mostly filled with compliments, thanks to people appreciating a well-thought-out system. There are small details that may prevent some users from experiencing its ultimate benefits. Use this article and other Mighty Mule dual gate opener reviews to help you determine whether it will work on your premises. Its strength and versatility make it worth a try, especially on long, heavy gates.